I recently bought a used BH-55 ballhead. I'm fulfilling an eight year old equipment need to have a tall, robust but lightweight tripod and head. Actually, I have a large, robust tripod but it weighs just shy of half a ton. Well, probably not quite that much, but that's what it feels like on long hikes. The used BH-55 came to me looking well used and dirty. That's okay, RRS makes great products, and I knew most likely the head would be perfectly fine. For reference, I've had a BH-40 for about eight years now. I've used it quite a bit and abused it some. It's had several hard knocks and the battle scars to prove it. It continues to work perfectly. I decided to take the well-loved BH-55 apart and clean it thoroughly. The head was difficult to rotate down into the front two slots, even with the tension (drag) setting reduced. There was a lot of gunk and debris built up around the ball. First step was to remove the panning base. There are four small screws on the bottom that must be removed. This is a great video that shows how to do it: youtube.com/watch?v=pZFAaUT7fnA. As shown in the video, you have to remove the small brass bushing. It will slide straight out, but you may need to knock it around a bit to free it. Then you unscrew the stainless steel plate that the brass bushing had locked into place. This stainless steel plate may be hard to start. There are a few blind holes in the bottom where you can insert something like an Allen wrench to get leverage and break it free. Now, there's a split collar that has to come out. 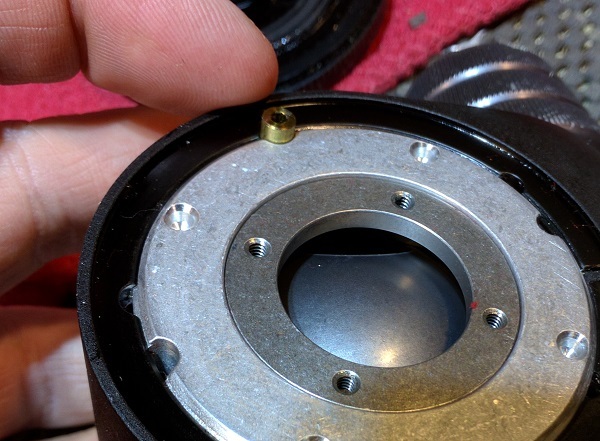 This collar is held in place by the screw (and knob) that locks the panning base function of the ballhead. 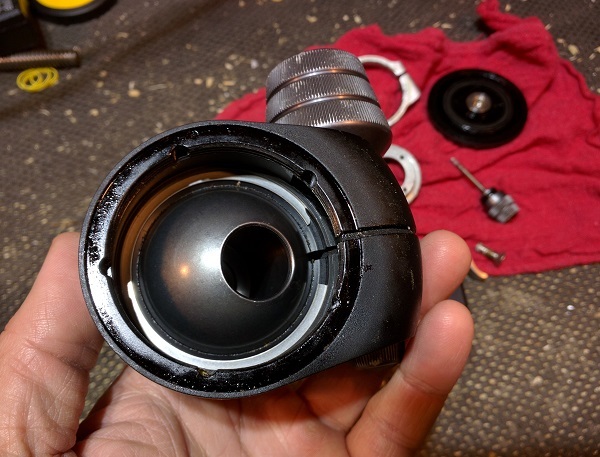 But first, the panning lock knob has to be removed. It has a plastic cap on the end that must be removed. Prying this cap out will likely destroy it, so beware. 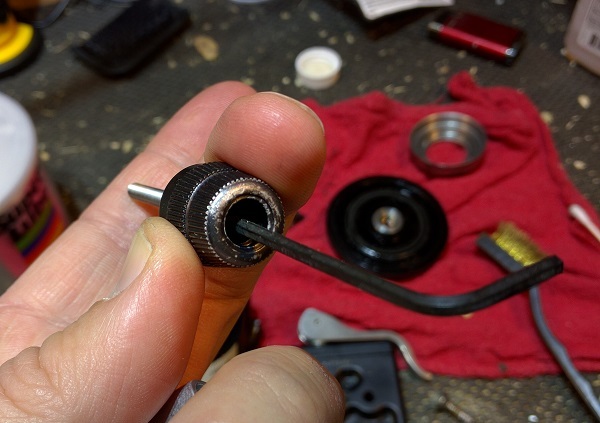 After the plastic cap is off, you'll see a screw head down inside the hollow knob. Remove the screw with an Allen wrench. NOTE that this screw is held in place with Loctite. So, it takes some torque to break it free and remove it. If it's too difficult, then you can apply heat to the split collar to help loosen it. I chickened-out at this point. 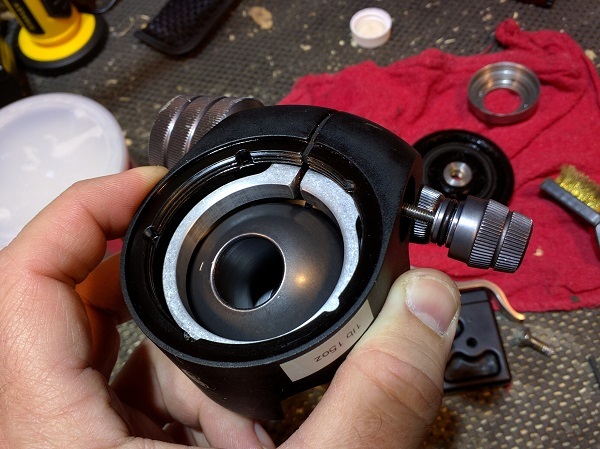 The next step WOULD be to remove the blind snap ring (aka circlip, or evil metal thing designed by satan). 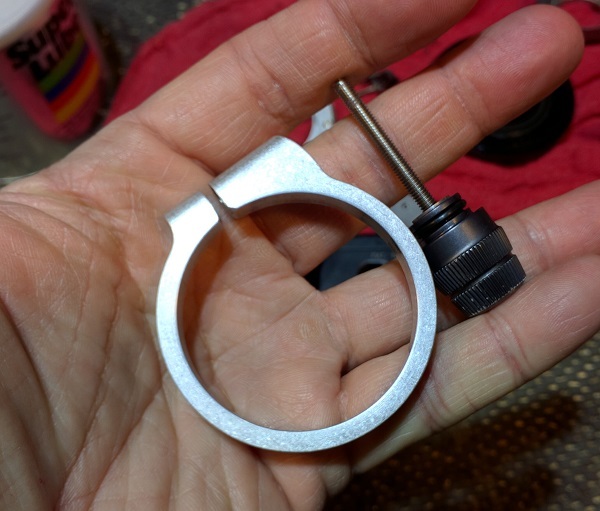 This would be very difficult because unlike normal snap rings that have tabs with holes, this blind one does not and therefore there is no special tool to remove it. Removing it would be a matter of prying it out with a flat screwdriver or similar tool. 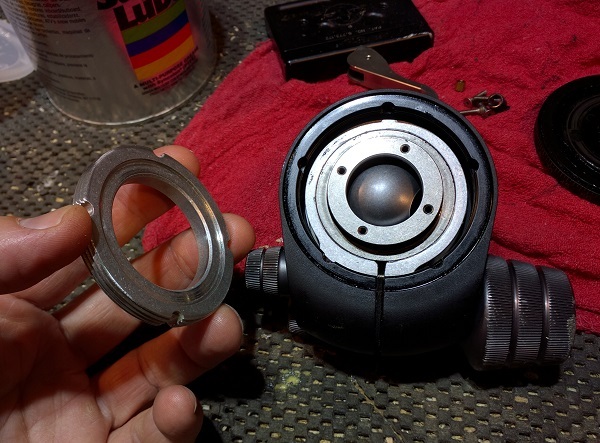 I made a few light attempts to do this, but the snap ring is substantially strong, and I feared that I would scratch-up the insides of the ballhead receptacle and the ball itself. However, at this point, the ball was very loose, and I was able to jiggle it around while using WD-40 and q-tips to clean all the small debris that had collected inside the head. And that was the whole point of this exercise: just to clean it thoroughly inside and out. 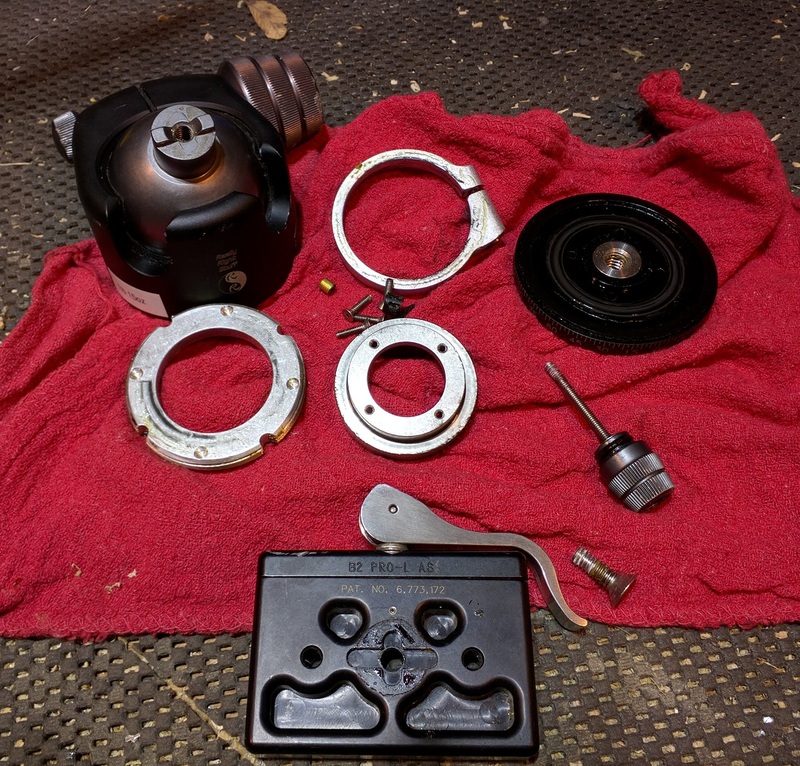 Reversing the steps above gets you a clean and fully functioning ballhead again. Wait... there are a few important details. 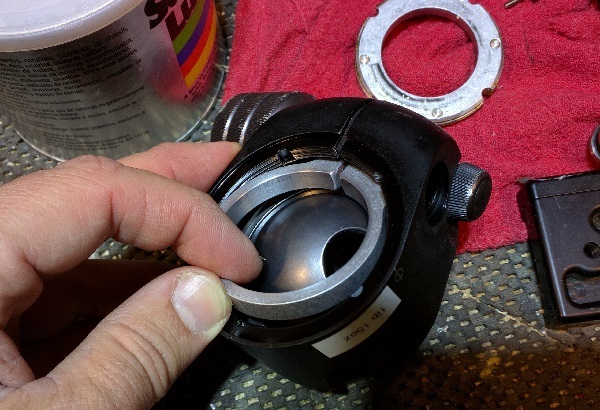 Remember the panning lock knob and screw that was held in place with Loctite? This will have to be cleaned (clean the screw and also threaded hole in the split collar) and new Loctite applied. Use Loctite #271 - red. The red Loctite is supposed to set up in 10 minutes. I waited a few hours just to be sure. I didn't mention it above, but the panning base has lube inside of it. New lube will have to be applied. 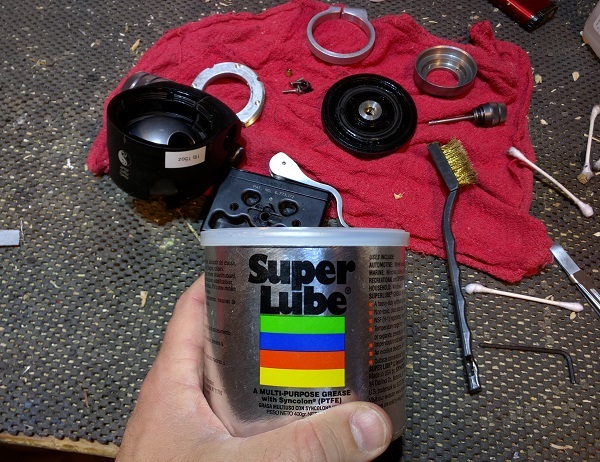 I used Super Lube All Purpose Grease. (remember, only the panning base parts get lubed; the ball itself stays dry). After initial re-assembly, the panning base was too tight to move. I had to go back and adjust the base one time to get the panning function to work properly. Basically I went through the procedure that was shown in the video (the first link above), except I loosened my panning base rather than tightened it (as shown in the video). Post adjustment, the ballhead worked perfectly. It panned snugly and the ball dipped down into the two front slots with ease. And it looked much better all clean and fresh. Throughout the whole process I was continuously impressed by the build quality and design. It really made me appreciate the good design and engineering that went into it, and I certainly can understand the price. In fact, I'm kinda surprised how low the cost is considering what goes into these things. 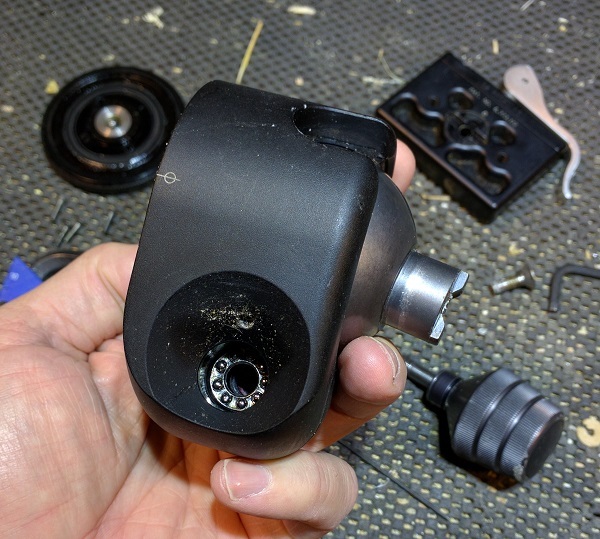 For example, I removed the ballhead lock screw and discovered a set of bearings where the knob makes contact inside the ballhead frame. This is quite a nice touch. I'm an engineer and a geek and I love this kind of stuff. This info will serve for future reference. I'm pretty hard on my gear and drag it around outside in dirty places, so I'm sure I'll be cleaning it again at some point.